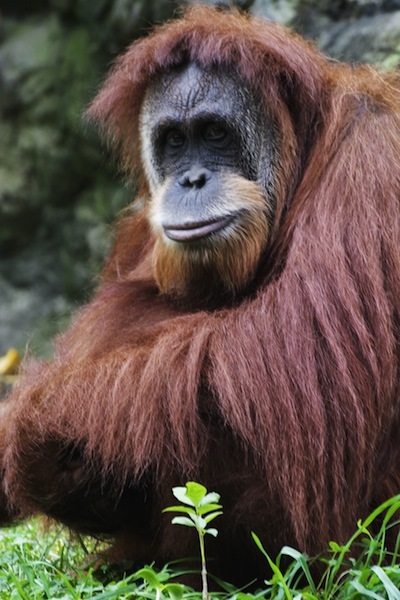 The Bornean orangutan is only one of two Asian “great” primates known to exist, in the region. This species of orangutan is native to the island of Borneo, as is its namesake. Like other great apes, this primate is very skilled to use advanced tools. They are thought to share ninety seven percent similarities in genetic structure with the human code. It is scientifically uncertain whether the orangutan’s subspecies are a genetic match, or simply a similar species. Weighing anywhere from 110 pounds as the lightest female, to 200 pounds as the heaviest male in wild, the Bornean orangutan is the largest living arboreal (entirely tree-dwelling) animal on this planet. They are the third largest ape; behind only the gorillas (two species) is sheer size and muscular ability. They stand about three feet tall when in a running position, and about five feet when fully extended. This orangutan has a distinct coat of wiry orange hair that coats most of the primate’s body. What are most interesting, are the orangutan’s especially prehensile hands and feet. They show a marked ability to grasp and manipulate complex tools to feed and occasionally play. Perhaps the added brain power can be attributed to the highly prehensile nature of the creature’s appendages, or vice versa, but the Bornean orangutan show incredible problem solving ability when used in conjunction with these self-made tools. As an almost lifelong arboreal species, the orangutan’s arms are extremely long, almost reaching an amazing seven feet. The especially long arms, while they may look spindly and weak, are one of the strongest muscles in the animal kingdom. These arms allow the orangutan to travel by swinging through the branches of lofty heights, and hold their immense body weight at the same time. Being an almost entirely arboreal species, the Bornean orangutan frequents the rainforests and lower mountainous regions with heavily forested areas. The orangutans prefer the high canopies of the forests indigenous to Borneo, and seem to do best in a region that is tropical to subtropical. While not necessarily nomadic in nature, the orangutan can cover a lot of ground, or tree if you will, in one day searching for fruits. Because of the vast deforestation of their natural habitats, the once free ranging orangutan has lost much of the habitat that it used to dominate. With the animals primary form of movement removed by clearcutting and natural desertification, the Bornean orangutan distribution has become localized and spotty, the creatures tending to form dense pockets where the natural tree layers still exist, and evacuating were humanities rampage has cleared the natural beauty. The Bornean orangutan is a solitary creature, more so than most primates who tend to be very social. They are not generally territorial, but the orangutans largely respect the space of their “neighbors” and stay out of the areas the other nearby apes frequent. Occasionally when two males meet in the same area, a brief fight or snarling match will ensue, but rarely are either of the two orangutans involved injured in any way. The majority of Bornean orangutan socialization comes during mating time, when the males seek out mates. Although the Bornean orangutan is a largely arboreal creature, it is not opposed to traveling on or near the ground, which could be due to the lack of predatory influence in the area. In the wild, a Bornean orangutan will live for about thirty five years without the predatory factor, while in captivity the orangutan can live up to sixty years. It is presently unknown why this orangutan has such a marked increase in lifespan under the care of humans. In the wild, Bornean orangutans have been observed doing amazing things with tools that we had priorly attributed only to humans. Scientists have spotted this breed of orangutan using spears to hunt fish, using leaves as a sort of toilet paper, and use branches that are crooked as back scratching devices. They have even been observed using leaves as umbrellas. The Bornean orangutan is a widely omnivorous creature, and has a nearly as diverse diet as humans. They are known to eat fruits, leaves, and plant shoots for vegetation, fish, honey, and eggs for protein. Some orangutans will even eat soil, if the acidity in their stomachs reaches an unmanageable level, showing an additional level of problem solving skills. On very rare occasions, the orangutan will hunt and eat smaller varieties of primate even. To get the adequate amount of daily hydration, the Bornean orangutan eats richly juicy fruits and they also drink at holes in trees that collect water during heavy rains. They are even know to clear these holes out of excess tree rot, to facilitate a more efficient water source. Of all of the primates’ diets, the Bornean orangutans is one of the most diverse, including over four hundred species of plants and animals in total. Mating, as with any primate, is a dominance ritual with the Bornean orangutan, where the “flanged” males who are older, but still in their prime, receive the best mating partners. The dominant males will usually choose a female that is already weaning a child, to ensure that the female is fertile. Unflanged, or non-dominant males still get a pick at the female stock however, and get to mate about fifty percent of the time. Females can mate as early as six years and can bloom as late as eleven, though the primate’s total amount of body fat seems to lower the age that ovulation begins in these cases. The female’s fertility cycle lasts about a month and the females reach a menopausal state at about forty when observed in captivity. When birth is given, the child is weaned for eleven years, sometimes longer. During that time, the mother is very protective of her young, and will act very aggressive when the child’s safety is at risk. The baby will generally cradle itself closely to the mother’s chest, holding on to the chest hair for stability. The current conservation status of the Bornean orangutan is endangered, with present trends showing an increased possibility of extinction. There are a little over fifty four thousand Bornean orangutans still propagating, but with the prevalence of palm oil plantations, deforestation, and illegal logging companies in the area, that number is still very rapidly shrinking. Humans have continued to endanger this wonderful creature by making it one of the primary mainstays in the bushmeat trade. Poachers to this day, hunt the orangutan for trading and some natives for their meats. What is worse is that the local Governments do not react harshly to the orangutans being hunted, because they often impede the progress of industrialization. However, many courageous rescue centers have sprung up across the world in recent years, protecting, and attempting to rehabilitate orangutans crippled by the forward motion of man. Often, an orangutan’s mother is killed, so the children that are immediately available can be sold to the pet trade, or zoos. These rescues teach the orangutans that remain how to survive in the wilderness, and wean them to adulthood, or back to health.